A week prior to the start of the performances in A POSSIBLE ISLAND? 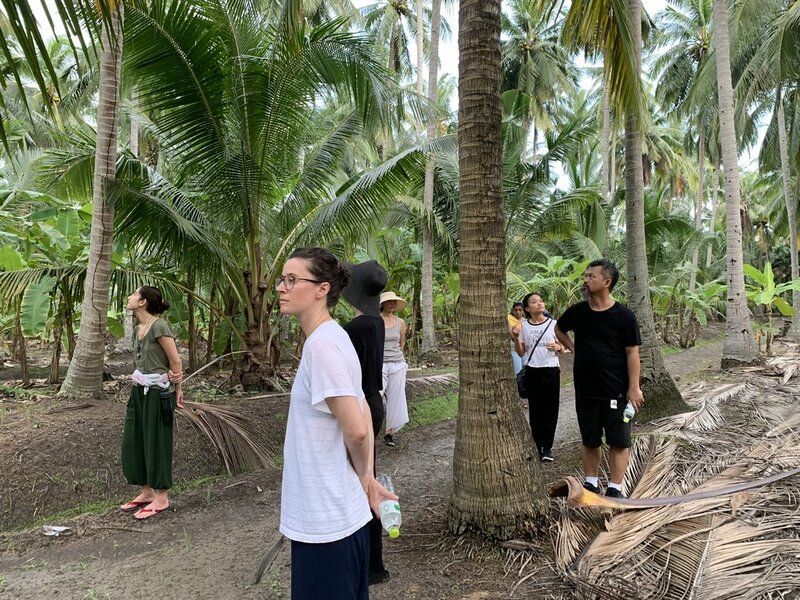 , the 8 performing durational artists went into the countryside of Thailand to participate in the Cleaning the House workshop. The workshop follows several rigorous conditions: no speaking and eating, no electronics or tools to tell time, and no reading. The artists participated in numerous repetitive durational exercises, in order to equip themselves with a tool belt of experiential ideas to use during their performances. The exercises included mutual gaze, blindfold in nature, opening and closing the door, counting the rice, and more. These seemingly simple and repetitive exercises are done for long periods of time. The artists create their own methods to doing them, and create their own meaning through each action. The repetition and length of time contributes to a sense of hyper awareness to each gesture. Through the days, the artists collectively engage in these exercises, but also develop concentration within their own mental and physical universes. A final exercise, the artists were asked to create their own repetitive action and carry this own for the last hours of the workshop. The result was a simulation of performing together, an energy that they would bring to the Bangkok Art and Cultural Centre the following week.